381 mm/50 OTO 19343 х 3 pcs. 90 mm/50 OTO 193912 х 1 pcs. Initial HE Shell Velocity860 m./s. 152 mm/55 OTO 19362 х 3 pcs. 37 mm/54 Breda 19328 х 2 pcs. 20 mm/65 Breda 193516 х 2 pcs. 37 mm/54 RM 19394 х 1 pcs. Roma — Italian premium Tier VIII battleship. A Littorio-class battleship. She carried powerful main battery guns for a ship of her size, was protected by reliable side armor, and had good torpedo protection. However, the ship did not have good AA capabilities to efficiently counteract airstrikes. Roma was first released for sale on 18 January 2018 for the NA server and 19 January 2018 for the EU server. Roma is a fast, mobile battleship with exceptional stealth. Boasting better speed and maneuverability than even Japanese counterpart Amagi, Roma can quickly move around the map and take strategic positions before other battleships can get there. Roma’s stealth is one of her primary assets, capable of getting her into positions undetected; her detection range is nearly best-in-tier for a battleship (the British Monarch edges her slightly). Also in the positive column: the performance of her main battery shells. They have similar ballistics to Amagi, and captains familiar with that ship will be comfortable using Roma’s guns. Her dispersion is fairly poor, however, and her excellent shell velocity is somewhat misleading; Roma will actually struggle to land citadels and regular penetrations against broadside cruisers. Due to the excellent penetration characteristics of her shells, she will frequently over-penetrate lightly-armored targets instead of hammering them. The amazing penetration values of her main battery are nearly unparalleled and new captains are advised to allow for an adjustment period in learning when to fire her guns to land maximum damage against enemy targets. Roma’s anti-aircraft defenses are downright atrocious. She edges out Tirpitz and Amagi in the AA department, but only just, and her AA suite has a mere 4.0 km maximum range. Captains are well-advised to stick close to friendly ships for air protection in matches that feature aircraft carriers. Her armor scheme is fair overall, though Roma has a major weakness in her raised citadel; if caught broadside, she can take massive amounts of damage. Angling is typically effective in avoiding such hits. Her speed and stealth are Roma's biggest assets. 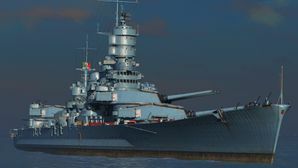 No other battleship at Tier VIII combines the speed and stealth that Roma boasts. In addition to being able to sneak up to enemies and catch unsuspecting cruisers broadside, she can use her strengths to retreat into stealth in disadvantageous situations. As long as enemy planes are not present or kept in check, Roma is a solid ship with all the tools necessary to contribute to her team's success. Armor scheme makes Roma good at bow-tanking. High penetration AP shells can citadel many battleships at long range. Poor AA performance for her tier, with primarily short-ranged, low damage guns. Main battery performance hampered by inconsistent dispersion. High AP penetration also means that many targets will be over-penetrated. Citadel sits slightly above the waterline, exposed to penetration. Mediocre performance of secondary guns. As a premium ship, Roma doesn't have any upgrades to research. Slot 3 offers several options. Most captains may find Aiming Systems Modification 1 most useful for decreasing the main battery's maximum dispersion value. Captains building Roma around her secondaries may opt for Secondary Battery Modification 2 ( ) for the increased secondary range. Alternatively, AA Guns Modification 1 ( ) can be mounted to bolster the ship's flak bubble. Slot 4 is most commonly filled with Steering Gears Modification 2 for the reduction in rudder shift time it provides. Captains looking to improve upon Roma's survivability may find Damage Control System Modification 2 ( ) more useful. This upgrade reduces the time required to extinguish fires or repair flooding. A basic survivability build works quite well for Roma, complimenting her armor scheme and concealment nicely. As with all other build suggestions, however, this is a recommended build, and thus subject to a degree of personalization. Captains are encouraged to pick and choose skills that fit their play style. As always, Damage Control Party II ( ) and Repair Party II ( ) are recommended for players who want to maximize Roma’s survival in matches. Spotting Aircraft ( ) or Spotting Aircraft II ( ) are recommended over Catapult Fighter, as Roma’s main gun range is very short, and captains will invariably want to extend it on occasion. As a premium ship, Roma comes included with Type 10 camouflage that lowers her detection radius, reduces the accuracy of incoming shells, reduces her repair costs, and increases the amount of experience she earns. As a battleship, Roma’s main task is to remain as durable as possible whilst providing supporting fire for the team. Therefore, signals that help increase Roma’s survivability, such as India Delta ( ) and India Yankee ( ), are highly recommended. And as a premium ship, signals that increase credit and experience gain per battle are also highly recommended for players that need credits and those that wish to have a dedicated captain for Roma. Flag of Roma. Given to players who purchased a special bundle containing Roma. 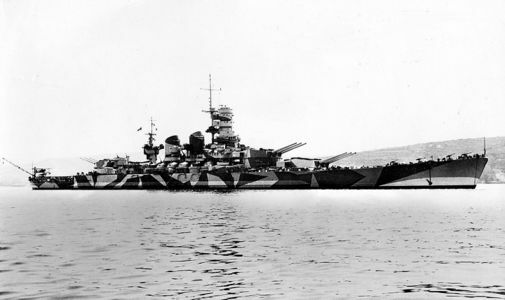 Roma in 1942, with the camouflage scheme she wore for most of her career. The Washington Naval Treaty of 1922 forced Italy to rethink their designs for battleship construction, due to the new limits placed on them by the treaty. The design board came up with various designs for new ships, ranging from a 23,000 ton, 6 x 381mm design, to a 35,000 ton, 406mm design, to a 26,500 ton, 8 x 343mm design. The final design was a 35,000 406mm gunned design, however the gun was abandoned in favor of the 381mm gun designed for the cancelled Francesco Caracciolo class battleship. This design, escalated to a 40,000 ton, 9 x 381mm design, was settled on, and the Littorio class was born. The armaments of the class were the pinnacle of the Regia Marina, and indeed some of the better 381mm guns in performance. The 381mm L/50 Ansaldo 1934 was built to elevate to 35 degrees, giving them a maximum range of 42,200km and making them some of the longest ranged naval guns in history. The rifles had extremely high muzzle velocity, however this led to increased dispersion at range; additionally, the reload speed on the guns was slow in comparison to guns of similar caliber to other nations. The armor of the class was designed to defeat 380mm shells out to a range of 16km , inclined at 11 degrees and layered in order to de-cap armor piercing shells. Roma also boasted a unique torpedo defense system called the "Pugeliese System". Her torpedo defenses were comprised of a 40mm thick bulkhead with a void inside housing an empty drum 38cm wide with 6mm thick walls; the rest of the void was filled with liquid. It was intended to defend against torpedoes with up to a 350kg warhead. Their propulsion systems were Belluzzo geared steam turbines powered by eight oil-fired Yarrow boilers. The engines were rated at 128,200 shaft horsepower giving the ships a top speed of 30 knots. Some of Roma’s sisters reached higher speeds than designed; Littorio, for instance, made 31.3 knots, while Vittorio Veneto made 31.4 knots at light loads. In her original configuration, she was equipped with 12 x 90mm/50 AA guns flanking both sides of the superstructure, 20 x 37mm/54 AA guns in eight dual mounts and four single mounts, and 20 x 20mm/65 AA guns in ten dual mounts. The ship's aircraft facilities were housed on the aft of the ship underneath the "X" turret. To allow better handling of aircraft, the "X" turret was raised to a higher deck level to keep from damaging the aircraft or facilities. Roma, named after the city of Rome, was ordered in 1937 as the third Littorio-class battleship. She was constructed by Cantieri Riuniti dell'Adriatico shipyard in Trieste, Italy. She was laid down on 18 September 1938 and launched on 9 June 1940. Launched on 9 June 1940 — a day before Italy’s entrance to World War II — it would take another two years for Roma to join her sisters Littorio and Vittorio Veneto at sea, finally being commissioned into the Regia Marina on 14 June 1942. By this point, the war was not going well for Italy. The strategic situation in the Mediterranean favored the Axis, but the United States joining the Allies in the war the previous winter was slowly beginning to shift things against the Axis powers. The key Allied central Mediterranean base of Malta was in desperate need of supplies, but severe fuel shortages put extreme limitations on the number of ships the Regia Marina could sortie in an effort to interdict the Royal Navy's efforts to keep the island supplied. Although she participated in training exercises and moved to various bases along the Italian shoreline — including Naples, La Spezia and Taranto — Roma never truly sortied to battle. By the end of 1942, only Littorio, Vittorio Veneto, and Roma were combat-ready; four of Italy's other modernized battleships — including Giulio Cesare — were removed from service due to a lack of available fuel, and the lack of capable escorts due to heavy losses sustained while trying to keep the convoys to the Axis-held portions of northern Africa running ultimately meant that the Regia Marina lacked the strength to oppose the Allied forces. In November 1942, Roma came under attack by a British submarine while underway from Taranto to Naples, although the submarine scored no hits. While at Naples, on 4 December 1942, a powerful American-led air raid hit the city in an attempt to destroy the tattered remnants of the Regia Marina; Roma managed to avoid damage. Two days later, she was moved to La Spezia alongside her sister ships, where Roma became the flagship of the Regia Marina. She remained at La Spezia for the rest of Italy’s part of the war until the Armistice in September 1943. Before the Armistice however, Roma and the remainder of the Regia Marina anchored at La Spezia suffered continuous air strikes throughout the year. Roma initially avoided direct hits, but near-misses caused extensive flooding, and later she took a direct hit aft of turret "X", destroying several compartments and sustaining additional flooding from broken piping; another bomb directly struck the roof of her rear turret, but caused virtually no damage. After this second raid, she sailed to Genoa for repairs, remaining there from June to August 1943 before returning to La Spezia. Roma and the majority of the Italian fleet had been anxiously awaiting orders to intercept the Allied ships sailing to invade the Italian mainland; instead, information came that on 8 September 1943, Italy had officially signed and armistice with the Allies and the operation was cancelled. Roma, now serving as the flagship of Admiral Carlo Bergamini, was ordered to sail to an Allied port to avoid capture by the Germans (who had almost immediately attacked Italian territory after the armistice was signed). Bergamini, not fully knowing the details of the armistice and what would happen to the Regia Marina, sailed from La Spezia for La Maddalena on the northern tip of Sardinia, and intended to sail on to Malta from there. After departing La Spezia, Bergamini learned that La Maddalena had already fallen to German troops launched from Corsica, so, on 9 September, he diverted his course to go directly to Allied-held Annaba in Algeria. When Germany learned of this, an air raid composed of Dornier Do 217s armed with "Fritz X" radio-controlled bombs attacked the Italian fleet while they were between Corsica and Sardinia in the Strait of Bonifacio. The German bombers initially trailed the fleet for some time. The Italians did not open fire, as the considerable distance between the fleet and the German aircraft made it impossible to identify if they were Allied or Axis; Bergamini believed that they were the air cover promised by the Allies. When the Do 217s descended on the Italian fleet however, the ships were spurred into action, as AA guns opened fire and evasive maneuvers began. About 15 minutes after the Do 217s first descended, Littorio took a hit to the starboard below her fore main turrets, and Roma took a hit on the same side, causing considerable internal damage to her engine rooms. Roma quickly began to fall behind the main group. Thirty minutes later, a second "Fritz X" penetrated through the starboard side of Roma’s deck, causing heavy flooding in her main engine room and quickly spreading to her magazines. Seconds after the bomb hit, a catastrophic explosion launched her turret "B" straight into the air, landing in the sea. Massive amounts of water rushed into ship's forward compartments and Roma capsized quickly, breaking in two before sinking beneath the waves. She took 1,393 men down with her, including Admiral Carlo Bergamini. Roma was in service barely more than a year before she was lost (June 1942 - September 1943). A digitally colorized photo of the battleship. Detail of the main guns. A model of the Roma in 1/100 scale. True color photo of Roma with one of her splinter patterns. Roma at anchor with several of her gun barrels at various angles. Side profile view of the ship. An overhead bow on view of the ship. Roma and her sister Littorio firing their main battery. Roma immediately after secondary detonations consequent to the Fritz X strikes, September, 1943. This page has been accessed 97,281 times.